The result: Floyd Mayweather Jr. has defeated Manny Pacquiao via unanimous decision. Check out the video replay of the fight of the century. However, netizens on social media believe it was the Filipino boxing icon who won. Some lambasted Mayweather saying what he did was to "hug-and-run" a number of times throughout the fight. 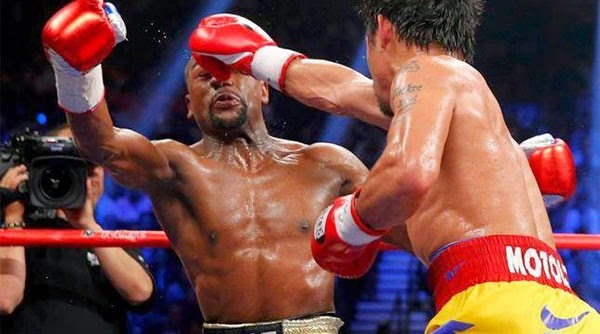 Facebook user Pham said: "Mayweather may have won the fight, but Pacquiao won the battle. The match only showed that boxing is not a noble sport anymore but a money making machine. The match moreover showed Pacquiao's superior skills and sportsmanship. The whole world now knows who is the best!" It seems an article from the Associated Press supports that statement. "Chances are, these guys will dance around the ring for 36 minutes, Mayweather piling up the points while an increasingly desperate Pacquiao goes for a Hail Mary of a punch," says an AP report titled "Mayweather-Pacquiao nothing more than an epic scam," which was published prior to the bout. The writer was right, don't you think? There's apparently another reason why Mayweather won. Reports said Pacquiao lost as he entered the ring with an injured shoulder. During the post-fight conference, it was revealed that the latter's camp reportedly tried to treat the injury with anti-inflammatory shots, but the Nevada Commission refused. Meanwhile, a certain Lance Adrian said Pacquiao may have lost, but he gained respect from people around the world including Americans. "BOTTOMLINE: Its okay to lose with HONOR rather than to win in CHEATING. Go Manny, We are still so PROUD of you. You have our RESPECT," he posted. Many said Pacquiao is still the people's champ.